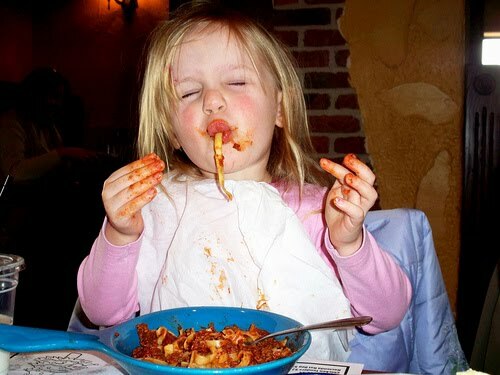 Let's face it, we all love spaghetti! I know I did and so did my sister. When she was in elementary school (about 8 or 9 yrs old), she declared that she loved spaghetti so much that she was going to marry an Italian man (a doctor) and eat spaghetti every day for the rest of her life. Then she would slurp that noodle into her mouth with such force, the end would slap her chin, nose, cheek...you get the picture. Well, she married an Italian but he was a CPA. As far as eating spaghetti every day, ummmm, she sure could...if he let her! As I've aged my tastes have changed and I don't care for all the sauce as much. So, I set out on a quest to find another way to enjoy pasta and still have the same flavors. And guess what? My sister, the spaghetti loving slurper, acquired a new recipe from a friend and it was to die for. 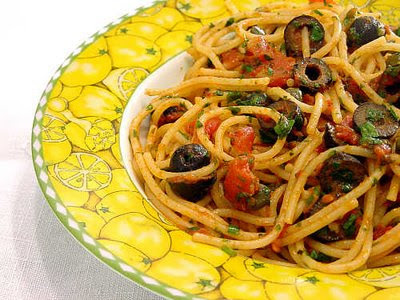 This robust combination is known as Spaghetti Alla Puttanesca which I usually serve with a chicken breast or pan-fried fish. Put pasta on to boil. Optional: Soak anchovies for 15 minutes in water then rinse and chop. Heat the oil on medium heat in a large skillet or pan. Add the optional anchovies saute, then crush with the back of a spoon until they fall apart. Add the tomatoes with juice, garlic, capers, olives and seasonings. Saute about 15 to 25 minutes. Taste and adjust salt and pepper. Cover and keep warm. Cook the pasta, strain, and rinse the pot. When the pasta is strained return it to the pot and put it on medium heat. Add the sauce and cheese. Toss together over medium heat until it is well coated. Serve.